Is Bob's Red Mill DARK Rye really dark rye? The Hodgson Mills Rye looks like it has darker flakes. But, I am not sure if that is what I should look for. I have read so many posts on dark rye, but I still don't know if either of these flours are truly dark rye. Any thoughts? Both of those are dark rye flour. Dark rye flour and whole rye flour are synonymous. All it means is that none of the bran or germ has been removed in the milling process. 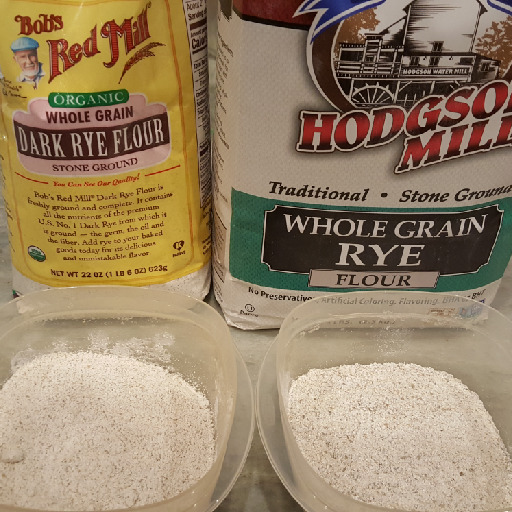 I have used both of these flours you have pictured and if my memory serves me the Hodgeson Mill is a little bit courser of a grind which is why it seems to have "darker flakes" to you. That being said I have also seen dark rye flour that is fine ground where the entire flour has a darker hue. If you think that you are going to achieve the "dark rye" color you see in a marble rye bread that you see at the store by using this dark rye flour I am going to have to burst you bubble. The majority of dark rye breads that are found commercially use caramel color to achieve that coloration. Alternatively some smaller bakeries have other ways in which they achieve the dark rye color including strong coffee, cocoa powder, molasses, and dark malt extract to name a few. The original dark rye coloration, however, was achieved through extremely long bake times at low or receding temperatures that caused the maillard reaction to penetrate the through the entire loaf. I believe the original practice was to put the rye bread in the wood fired oven at the end of the day after the oven had spent most of it heat and then remove it the next morning before re-firing the oven. This would allow the loaves to bake for 10-14 hours at low temp. It's the same whole rye flour. BRM looks lighter because of the significantly finer grind. Thanks to all of you. I had read posts about medium rye and dark rye so I wasn't sure. I wasn't looking for the dark color since I haven't baked yet, now I know. This is for a rye starter that needed Dark Rye. Thanks again.